I’m always searching for new easy, healthy, and tasty recipes to try and share with you guys. I am a huge greek food lover, but also am usually on borrowed time when it comes to making dinner. That said, I wanted to create a recipe that was easy to make, but that would be enough to have leftovers for the following day or two. If you have any specific dietary preferences, you can easily substitute ingredients and make it your own! Next to some of the ingredients, I have listed alternatives so that hopefully everyone can enjoy the recipe. If you decide to try it out, feel free to post photos on your social media with the hashtag #aucourantlife and tag me @carly_weinstein. Enjoy! In a large plastic bag, combine all the marinade ingredients & add chicken. Shake around, then place in fridge for 20 minutes, or leave overnight for stronger flavor. In skillet, heat olive oil over medium-high heat & add chicken. Cook chicken about 5-6 minutes then flip & repeat time (cook time depends on stove and pan; may need more or less time). Take chicken out, let cool, and then cut into pieces. While chicken is marinating, make the greek salad by cutting necessary ingredients and tossing together in bowl. Cover with plastic wrap & let sit in fridge until you’re ready to eat. To make the Tzaziki sauce, combine all ingredients listed, taste, then add more of anything if necessary. Cover bowl with plastic wrap & refrigerate until ready to eat. Cook brown rice according to directions (I use Uncle Ben’s Ready Rice). 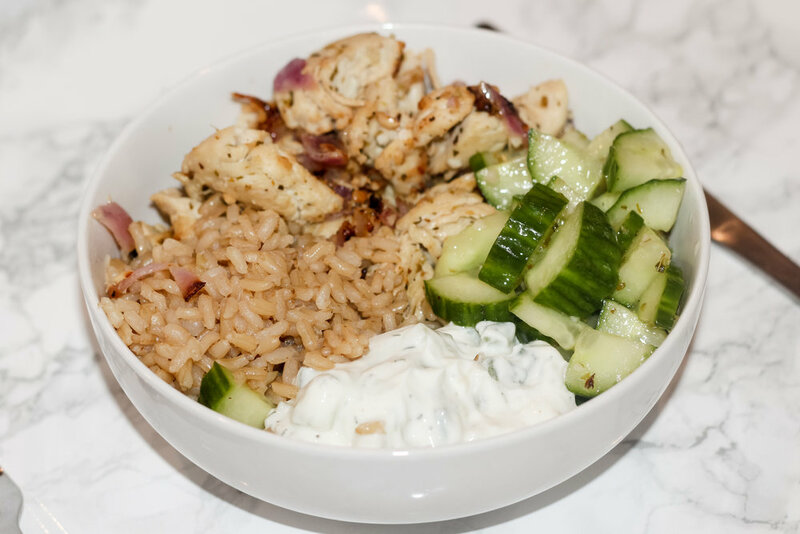 Create 2 bowls, or make one and meal prep the other. 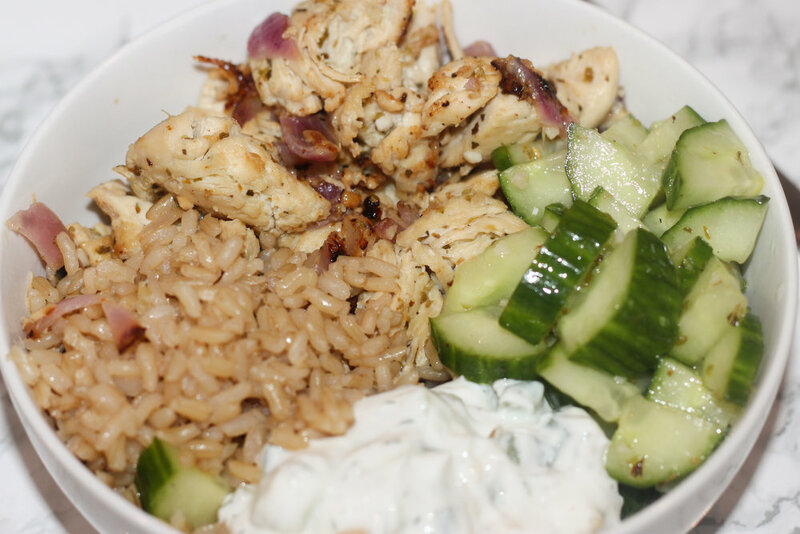 Cover the bottom of your bowl with half of the brown rice, then top with half of the chicken, salad, and some tzaziki. Store the leftover ingredients in containers & reheat up to 5 days later.